There were lots of surprises in the run up to Jade Dixon and Simon Moore’s wedding, including on the big day itself. 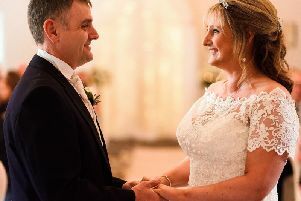 They married at Williamson Park in Lancaster surrounded by family and friends before heading to Forrest Hills for a reception. During a holiday to India, Simon had Jade’s engagement ring made as a surprise before proposing. They also had their wedding rings made in India too. And the surprises kept on coming when their wedding day dawned. Jade, 24, a manager, said: “We were only supposed to have one wedding car but we got a surprise with three – a present from my uncle and auntie. “One of the cars was a Rolls-Royce for me, there was a Jaguar for Simon and a limousine for the bridesmaids and men. “The speeches were amazing. The best man did a good one but my sister did a rap for us which was a huge surprise. “My dad didn’t really want to do a speech but he did and once he did, there was no stopping him. Simon, 24, a fork list truck driver, said: “The best part of the day for me was seeing my bride walk down the aisle, I thought her dress was just out of this world, Jade looked amazing. 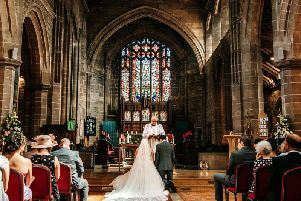 Jade added: “The best part of the day for me was seeing Simon face when I walk down the aisle. “I loved seeing how happy everyone was for us and how very proud my mum and dad was. “I love everything about the wedding wish we could do it all again. The couple honeymooned in Morocco.